The setting is an eighteenth century historic manor encompassing 45 acres of orchards, gentle rolling hills, woodlands, and ponds. The manor is set in the haunted Catskill Mountain Region of New York, and is the backdrop for the Legendary Headless Horseman Hayrides & Haunted Houses. An event that is galloping into its 19th season and continues to expand. 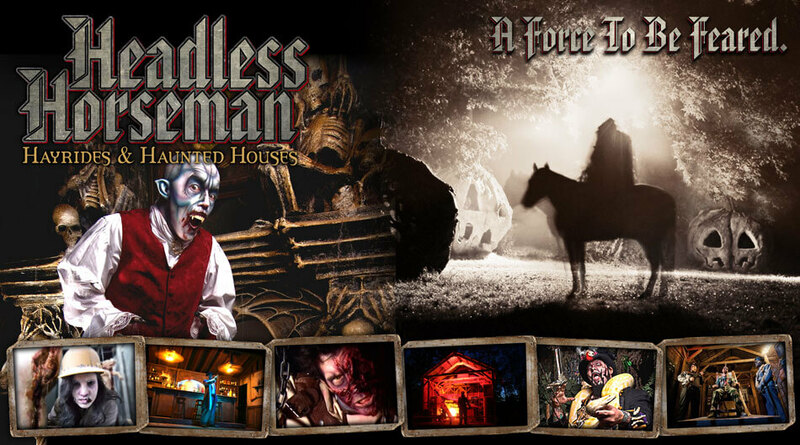 What began 19 years ago with a passion for horses, a carriage business, the love of “all things haunted” and a far fetch idea (that by the way everyone said would NEVER succeed) Headless Horseman Hayrides and Haunted Houses (H5) was born and continues to haunt the world! 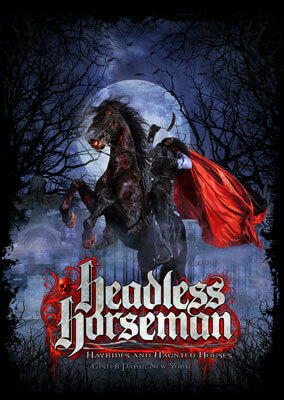 In 1993 Headless Horseman Hayrides was in its infancy with a hayride, a hotdog stand, a wall of t-shirts and 35 actors. It opened the doors 30 days after purchasing the historic farm in Ulster Park, New York. Today it takes 365 days to open with 9 attractions, a theme that changes each year, now encompassing a hayride, corn maze, 6 haunted houses, an outdoor haunted walk, Midnight Gardens, sideshow, 5 gift shops, 4 eateries and a staff of 265+. 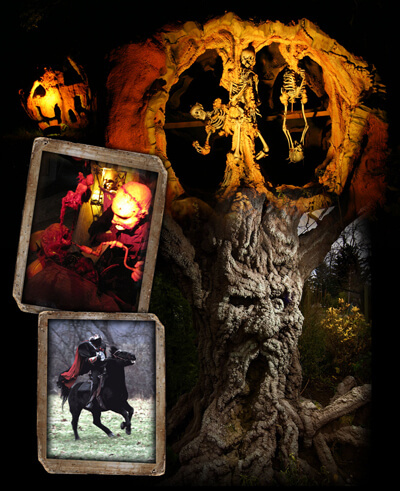 Headless Horseman Hayrides and Haunted Houses is a destination visited by thousands of people from across the country each year. Actor Matthew Grey Grubler from the hit TV show(Criminal Minds) flies in every year from LA with members of the cast to visit in addition with other notable and professional actors that haunt the Hudson Valley. Headless Horseman Hayrides and Haunted Houses has the honors of being named # 1 in America two consecutive years by HauntWorld Magazine, named #1 on the Planet by New York Daily News, named # 1 Outdoor Attraction by American Airlines, named #1 Scream Park and Hayride in America by HauntWorld Magazine, Listed Number 1 by USA Today,”Worlds Best Haunted Hayride”by AOL News, named America’s Scariest Haunted House Northeast Region by MTV and has consistently been named in the Top Ten Haunted Attraction by CNBC and AOL. It has been featured on The Travel Channel, Comedy Central, Emeril Live, Good Morning America, Nightline, CBS Evening News, NBC Nightly News and featured in several national publications. Each attraction is extremely detailed and painstakingly themed to authenticate what you would expect to find on a haunted historic estate. A backdrop that cannot be replicated. The night breeze, rustling leaves of ancient maple trees and shadows that walk in the night creates a haunting ambiance. You enter a midway of giant historic barns and stone buildings that house gift shops and eateries leading to the hayride wagons. Twelve tractor pulled wagons wait to take you on a journey of suspense. Board a wagon and begin your one mile journey. 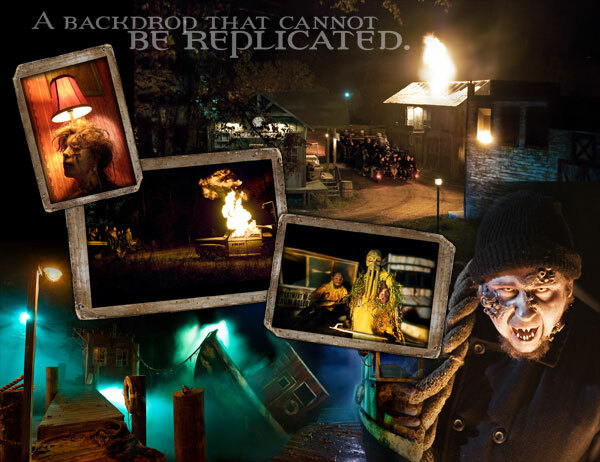 The hayride is a theatrical experience like no other with movie quality sets, animatronics, costumes, makeup, sound, pyrotechnics, high tech special fx and illusions Guests are transported into a surreal world of horror and evil. The hayride winds through the woods, open meadows, orchards and along the edges of two ponds. Orlando Special Fx installed several pyro fx, flaming buildings, exploding fire balls and a gigantic misting system for the newly constructed Crow Hollow Harbor. This expansive set includes three 40 foot fishing boats, one of which is sinking and on fire. The set also includes a tavern, bait shop, dry dock building, captains harbor house and a cold storage facility. All the sets along the hayride trail are three dimensional decorated inside and out. Many doors and windows are left open so you can get a peek at the interior of the buildings. Looming just ahead at the end of the hayride trail is the dimly lit neon sign of the Lunar Motel begging you to check in. This is the first of 6 haunted houses at the Horseman. Once a flourishing destination for travelers, the motel has been condemned and abandoned by its owners. There are reports that the owners are seen in town only during the daylight hours. They disappear into the shadows when sighted. It is said that they still run the motel, but they have been bitten by beasts and transform into werewolves when night falls. They lure people to their motel where they kidnap them under the veil of darkness………. There are always vacancies at the Lunar Motel. Stepping foot into this haunted house transports one back to an original 1950’s road side motel, including the rancid smell of nicotine permeating from the drapes, bedspreads and rugs. THE BEDBUGS DO BITE! Art deco lamps and décor and vintage vending machines decorate the rooms. Strategically placed animatronics, actors, videos and sounds keep your heart pounding as you become a lifetime guest of an unforgettable experience! The Second Haunted House is “Gluttons Slaughter House” The small town of Crow Hollow flourished from a very productive meat exporting factory. Business was booming for the world-renowned meat plant...until ablight wiped out all the livestock. Strangely enough the lack of animals did not effect the production of the slaughterhouse. Production continued. No one questioned the shipments that left the factory in the dead of night. …. This authentic haunted house was carefully recreated to resemble a slaughter house from the 1940’s era. The sounds of animals being slaughtered, the odors of decaying carcasses, giant water features, dripping blood of dead cows hoisted overhead, freezer rooms, slaughter stalls, a human grinding machine, hundreds of slaughtered animals and the sadistic butcher that will lead you to haunting nightmares for eternity. Even the tools-of-the-trade were recreated. The realism is horrifying! Escaping Gluttons Slaughter House leads you to the 4 acre cornfield maze “THE DARK HARVEST”. Wandering through the endless maze of 10’ high corn stalks, encountering countless Scarecrows, the bee house, shanny shacks, giant pumpkins, crows, and larger than life insects are waiting to attack you. The backdrop of antique farm equipment utilized by the inhabitants of the hollow grounds adds to the Harvesting of Souls. At the edge of the corn maze is the “Night Shade Nursery” an authentic 20th century antique greenhouse that was purchased from an estate and moved to Headless Horseman. In the early thirties a botanist named Dr. Victor Lockwood made a breakthrough by cross breeding plants and introducing reptile genes to create vegetation with unique survival skills and movement. His research earned him a nomination for the covenant honor of “Botanist of the Year... Unveiling his new species he quickly learned that the world was not yet ready to accept his mutations... He destroyed his life’s work! Sealing up the greenhouse, trapping the monstrous foliage inside, he hide his secrets from the world. For over eight decades the contents of the Nightshade Green House was a mystery. Do not dare cross the threshold to the greenhouse. We strongly urge you to exercise extreme caution and remember these plants are still growing and they haven't eaten in over 80 years! Don’t plan on buying pansies at this greenhouse! Lush vegetation suspended from the ceiling and climbing up the walls block your path of escape. Giant animatronics Venus flytraps that burst open with live actors are frightening. Co2 jets, in addition to a misting system cause additional panic. Snakes entwined within the foliage stare at you and a number of them actually strike out! Fantastic water features. Great special fx. The shy worm girl invites you to hold a handful of her pets distracting the unexpecting guest for an amazing scare! You encounter the demented farmer and his crop dusting equipment blocking your only means of escape. Exiting the greenhouse you find yourself disoriented at every turn and wonder endlessly through a fog filled lattice maze inhabited by mutated creatures of the dark harvest. 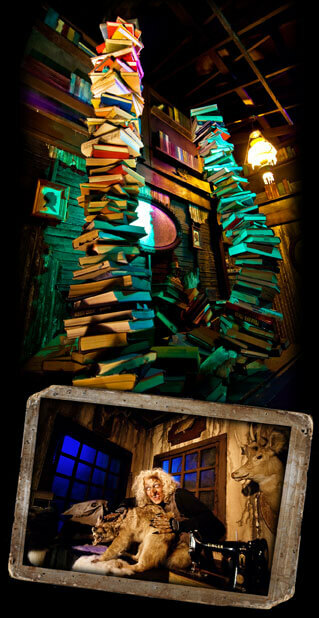 The only means of escape is through our new 2011 attraction, that will take our guests into an environment never experienced before! The Feeding is the 5th Haunted House. This is a Saw movie on steroids! In the early 1900's a world renowned chemist, Thaddeus Preston, was best known for his medicinal tonics and elixirs. Although these tonics and elixirs claimed to save lives, they did not equal the amount of deaths caused by his experiments throughout the years. One specific elixir labelled Anti-Pain Serum was the most popular. The chemical compound called PX-19 contained a mixture of altered plant forms from a nearby compost pile. Although it left the patient without pain, the serum had serious side effects including hallucinations, nightmares, and death. PX-19 had to be inhaled to achieve the desired results. Survivors say inhaling the elixir would bring their worst nightmares to life. The detail in this house staggers the imagination. A complete 1930’s dental operatory including x-ray machines, early dental chairs, dental tools, water chambers, flyover cages, leaners and “Collectors” haunt the hallways. A complete early physician’s exam room, an authentic embalming room purchased from the estate of first licensed female mortician in New York State leave nothing to the imagination. The nursery includes incubators containing fetuses and infants connected to feeding tubes, illusions, and of course the deadly chain saw! Before entering the queue lines for the 6th haunted house you have the opportunity to grab a bite to eat, get a souvenir photo at Dead Memories, catch the side show and stroll through the Midnight Gardens aglow with hundreds of eerie jack-o-lanterns hidden scarecrows and bewitching trees that stare at your every move. Last but absolutely not least is Dahlia Bloods Manor. This is a Victorian House. Natasha Price, was a true 1930’s debutant. She always wore the most extravagant dresses and furs. Unknown to the public she created her furs personally. Natasha had an obsession with taxidermy. She would acquire live animals through the sport of trapping. Before the animals were tortured to death, she would extract their eyes. She was fascinated with the eye. She thought the eyes were the window to the unknown. She said in death the glimmer of the light leaves the eye. By extracting the eye before the animal died it captured its soul... The Victorian décor in this haunted house hints of a Louisiana Mansion with the only escape through a town, the pier, and the bayou! With fantastic detail, the collection of taxidermy specimens are accented perfectly with human taxidermy forms. The main house holds a secret door that leads you through a haunting room that comes alive with sound FX where walls and ceiling cave in on you. Through the library giant stacks of books sway as if to topple on you. Secreted in the basement is Dahlia’s skinning and sewing room. Large vats line the walls where human specimens are soaked to loosen their skins. The sound FX of a horrific storm with wind, thunder and lightening flash throughout. Then deep in the bayou you trudge your way through what feels like thick mud only to be trapped by the dead and the reptiles of the swamp. The 6th haunted house brings you back into the midway. Gift shops, eateries, music, line actors, stilt walkers, as well as character actors on an overhead stage throw free t-shirts into the crowd. The gift shops are themed: Scareware and Fear Gear have all the logo merchandise. Ghoulish Gifts sells outside decorations. Witchy Women has great jewelry and The Magic Moon Gift Shop is adorned with nostalgic Halloween gifts.